This post contains affiliate links. What does this mean?. The best diaper pails keep odors locked in and are easy to use. Here are my favorites! 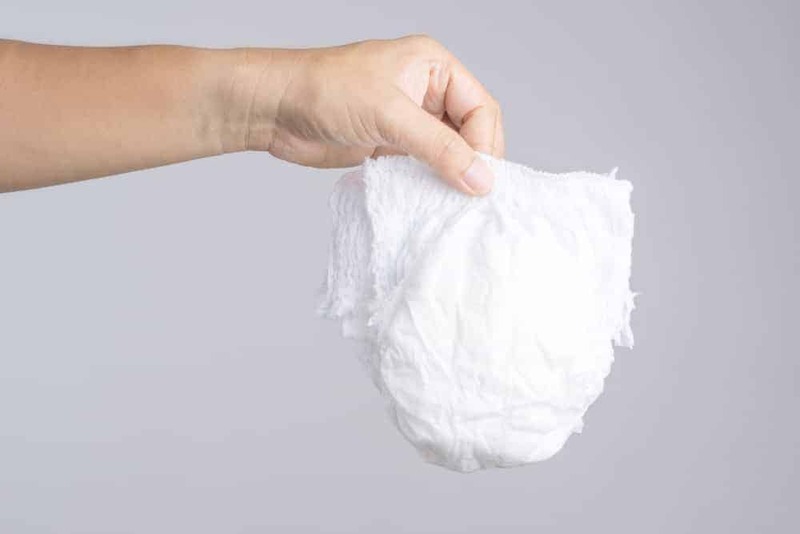 Babies go through several diapers a day, so it’s helpful to have a convenient place to dispose of them. If you’d like to keep it simple, you can just use a stainless steel trash bin but that won’t do much in terms of odor control. For this reason, many parents opt to add a diaper pail to the nursery. Diaper pails are designed to help keep odors contained, whereas a regular trash can would allow odors to escape anytime the lid opens. The best diaper pails keep smells in, are easy to use, and don’t require any special bags. The best diaper pails keep odors in. A diaper pail needs to keep odors contained. Once your baby starts eating solid foods, and their stools become more formed, you may want to flush the poop before discarding the diaper. However, even if you flush the poop first, you’ll still want a reliable diaper pail that controls odors without the use of air fresheners or fragrances. Another tip would be to keep the diaper pail in a bathroom (that has a window), rather than in the nursery. The best diaper pails are easy to use. Chances are that you’ll be holding your baby when tossing a diaper. For this reason, being easy to use is an important factor in choosing a diaper pail. Who wants to struggle to open a diaper pail one-handed? One more thing to consider is how the diaper pail looks in your home. 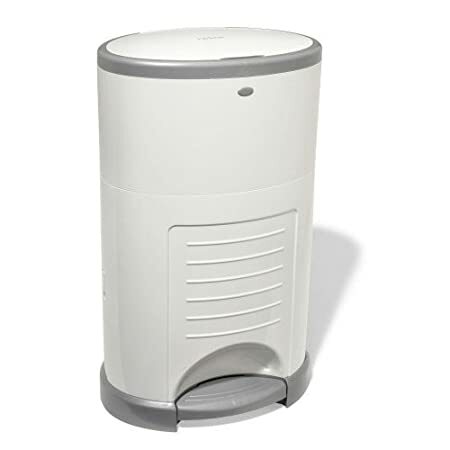 While this may not be the most important factor, this can certainly play a role in choosing the best diaper pail for you. There are several diaper pails on the market, but there aren’t many that meet these requirements. We have the Ubbi and love it. I know it’s expensive, but it is the only diaper pail that meets all of my must-have diaper pail requirements. Thanks to its powder-coated steel and rubber seals, the Ubbi is airtight and locks odors in. It also has a sliding lid that minimizes the amount of air exposure while you drop a new diaper in the pail, which is nice because it really does help. You will still want to hold your breath while changing out the bags. We air out our diaper pail near an open window whenever possible, too. And it comes with a childproof lock to keep those dirty diapers where they belong. 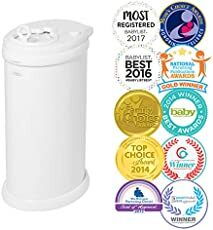 You’ll pay more up front for this diaper pail, but since it doesn’t require special bags like the other diaper pails do (though Ubbi sells them), you may end up saving money in the long run if you opt to use kitchen trash bags. A great, simple diaper pail that wins for its ease of use. 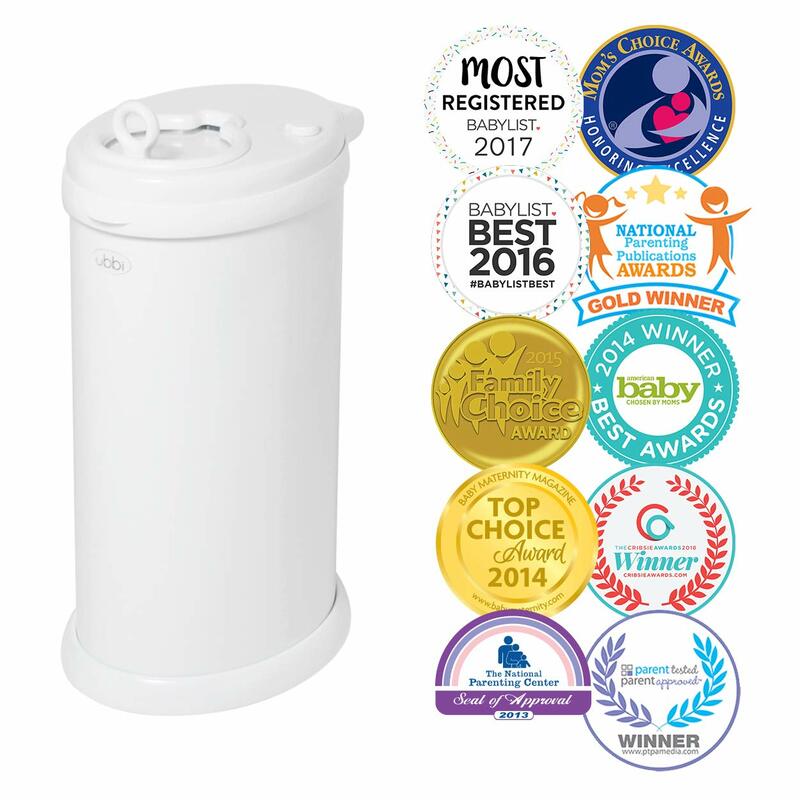 The Baby Trend Diaper Pail gets can be used with regular kitchen trash bags instead of having to purchase expensive refills. It does a decent job of managing odors, but you will be hit with a whiff every time you deposit a diaper. I recommend storing this in a bathroom (not in the nursery), and suggest keeping some baking soda in there as well. 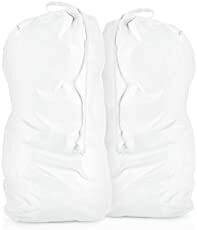 Alternatively, you could get some of these natural bamboo charcoal diaper pail deodorizers. They are somewhat helpful! 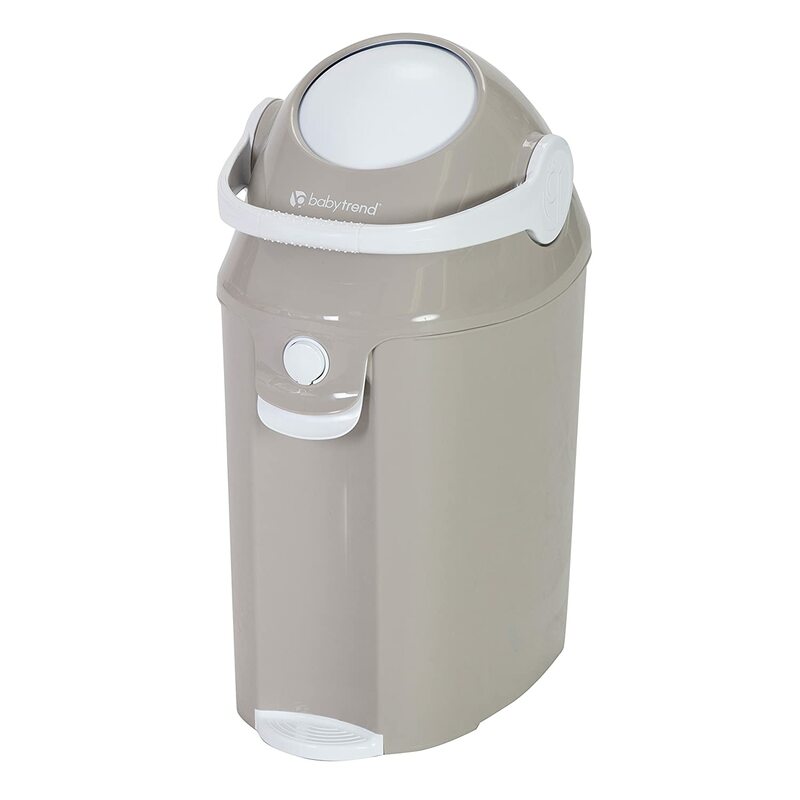 The Dekor Diaper Plus diaper pail is another good option to consider. It has a convenient foot pedal that makes it totally hands-free. And once you open the lid, there is a little trapdoor for depositing dirty diapers, which mostly helps keep odors in. While the company sells its own bags for this diaper pail, you can use your own trash bags. The Plus version holds a lot of diapers, but there is also a classic, more compact version available. The Dekor can be used with cloth diapers by adding their cloth diaper liner. While these diaper pails do a pretty good job of keeping odors in, it’s important to keep your diaper pail clean. Because diaper pails remain closed for so long they can become a breeding ground for bacteria and mold. Air out your diaper pail whenever possible. We try to air out our Ubbi whenever possible. We keep it in the bathroom next to a window, rather than in the nursery. Dispose of poop in the toilet. If your baby is eating solid foods, you should be able to dispose of their poop before throwing out the diaper. This will make a huge difference! Wash and wipe down your diaper pail. We like to clean ours with Better Life All-Purpose Cleaner. Every couple of months we will leave the diaper pail outside in the sun to help air it out. Deodorize the pail. We occasionally add essential oils to a cotton ball and leave it in the pail to improve the odor. That’s a wrap on the best diaper pails. Which one did you choose? Let me know below! Success! Just click the link we sent you to confirm your email address and you'll be all set. © 2019. All rights reserved. The Gentle Nursery™ contains affiliate links. | The content on this site is for reference purposes only, and is not a substitute for advice from a licensed healthcare professional. You should not rely solely on this content. I assume no liability for inaccuracies. Always read labels and manufacturer directions before using a product. Consult a professional if needed. | Amazon and the Amazon logo are trademarks of Amazon.com, Inc. or its affiliates. | As an Amazon Associate I earn from qualifying purchases. | These statements have not been evaluated by the Food and Drug Administration. These products are not intended to diagnose, treat, cure or prevent any disease.